Priscillas: The Most Wonderful Time of the Year! Can you stand the cuteness? Oh my gosh I love it! 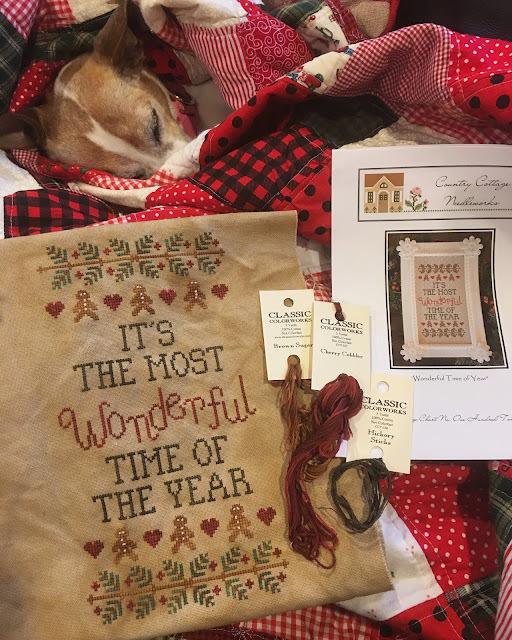 This is Country Cottage Needleworks The Most Wonderful Time Of the Year .. I changed the colors of floss..I used Classic Colorworks Cherry Cobbler, brown sugar , and spinach .. I use the Hickory sticks and the white dmc.. I had found this sign at Walmart so I wanted the colors to blend with it instead of the brighter red and green that was called for..
and glued it all around the wreath .. it included the flocked pine cones and the black snow covered berries.. I added the 2 vintage gingerbread men cookie cutters ( that were used when I was a kid)and also 2 bows made from the homespun and buffalo check .. 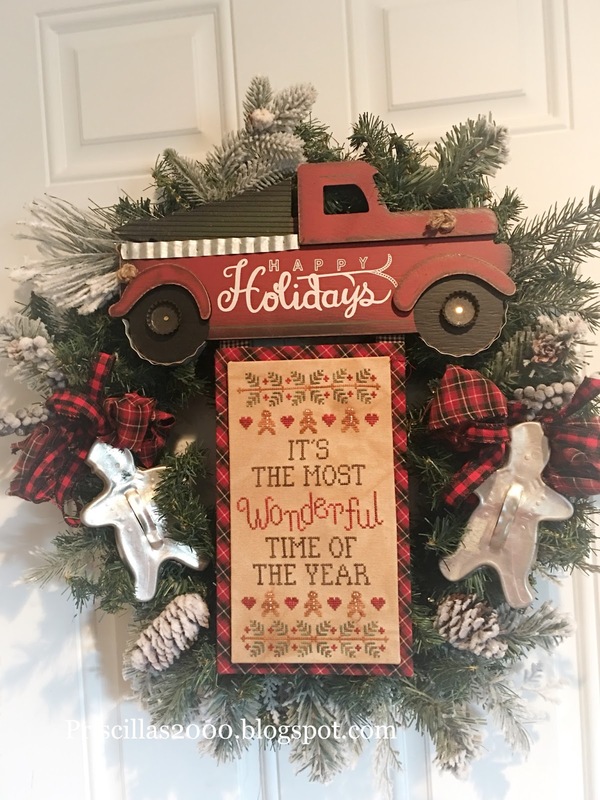 This will hang in my kitchen on the basement door for the Christmas season.. Love how it turned out! Another super cute finish, Priscilla! 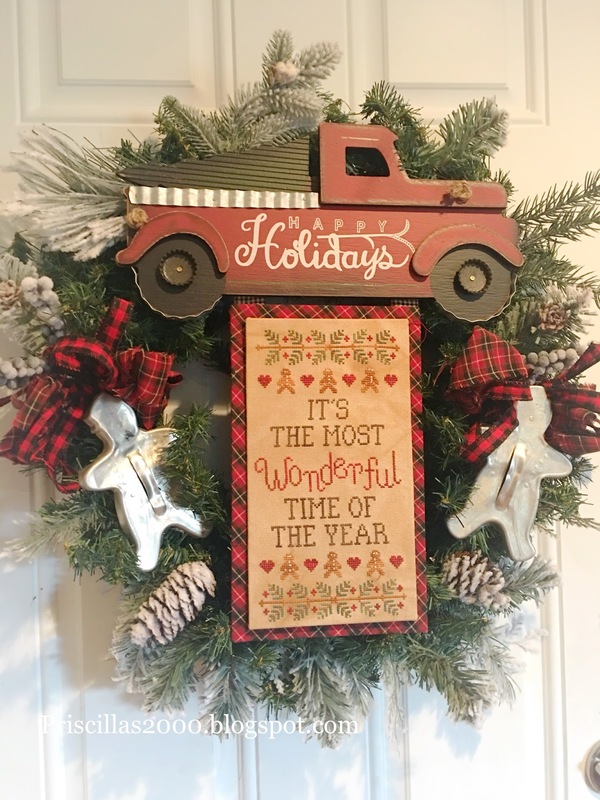 Really beautiful the wreath is a perfect finish. Your designs are really inspiring and have given me loads of lovely ideas I really enjoy Christmas just wish I had a bigger house. You are amazing!!! This is gorgeous! Now I have to go to Walmart.. When you're ready to pass this on...I want dibs! Love this finish! That is adorable!! I just bought that truck last week for my Hometown Holidays "The Tree Lot" by Cottage Needleworks.....can't wait to start stitching it!! Love your finish!! Beautiful and so creative! Do you buy all your sticky boards in bulk and cut them to size to fit each individual project? This looks like a long board...did you glue 2 together? I've been away for almost three weeks and am just amazed at all of the darling finishes you've done in that short time, Priscilla! 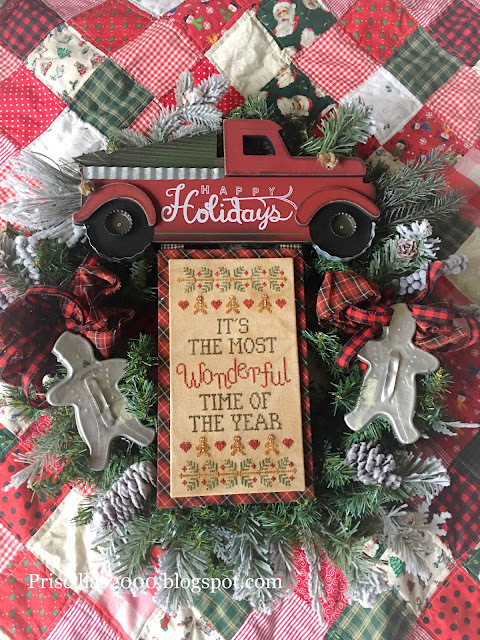 I just love this one--think we had those gingerbread cookie cutters when I was growing up! Thanks for sharing so many inspirational finishes! Another outstanding finish. So creative! Lovely finish, you find such great things to use in your finishing! I discovered your podcasts just a few weeks ago (on a friends recommendation) and have been catching up, Usually I don't watch stitching podcasts as they can be a bit, (dare i say it, boring?? ), but you two are so entertaining! I love watching you and seeing what you have both been stitching. Omg, the dogs Crack me up. 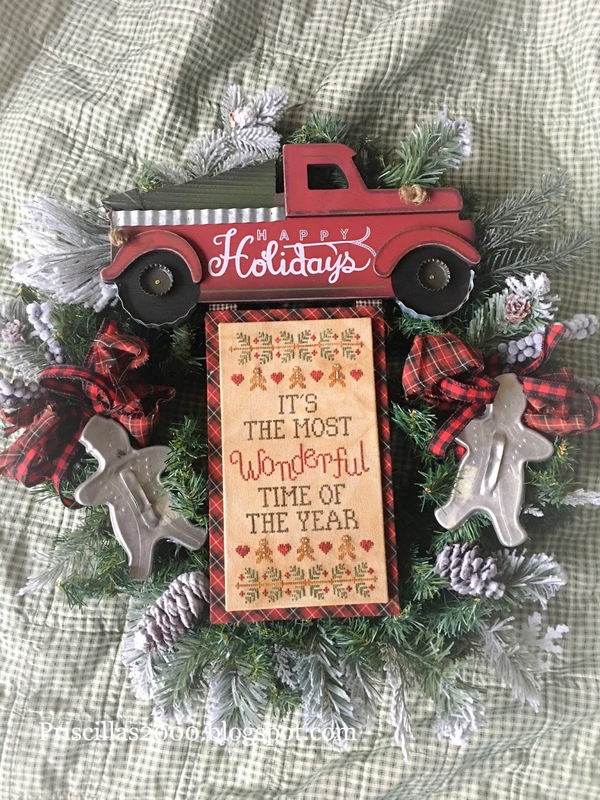 A cute wreath. Oh, that is so cute! It really showcases another great design by CCN. Which you no doubt stitched in record time! Thanks again for sharing with us! You make most of us take longer when we go to any store now... looking for items to embellish! Hugs! I love the finishing on this piece, but tell me how you care for it at the end of the season? How do you store it to ensure that it stays fresh for next year? 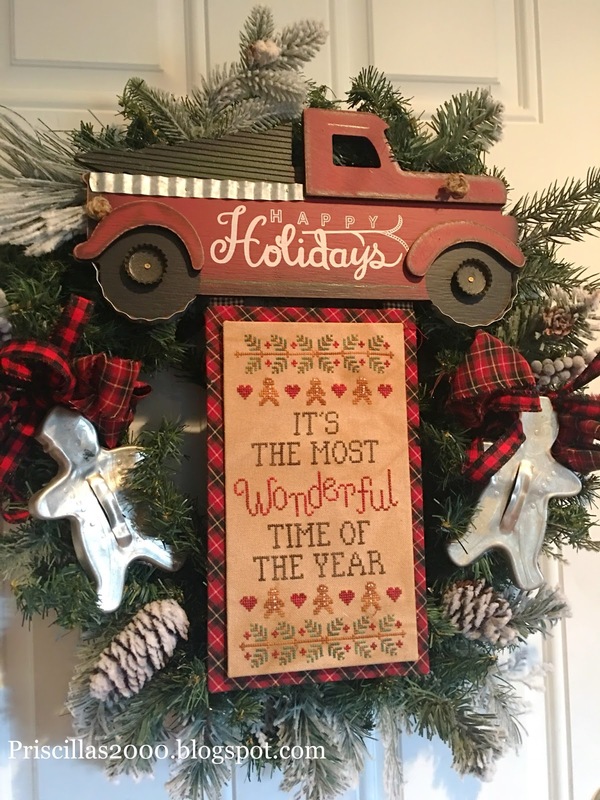 Love the wreath and stitchery!! Very pretty! !